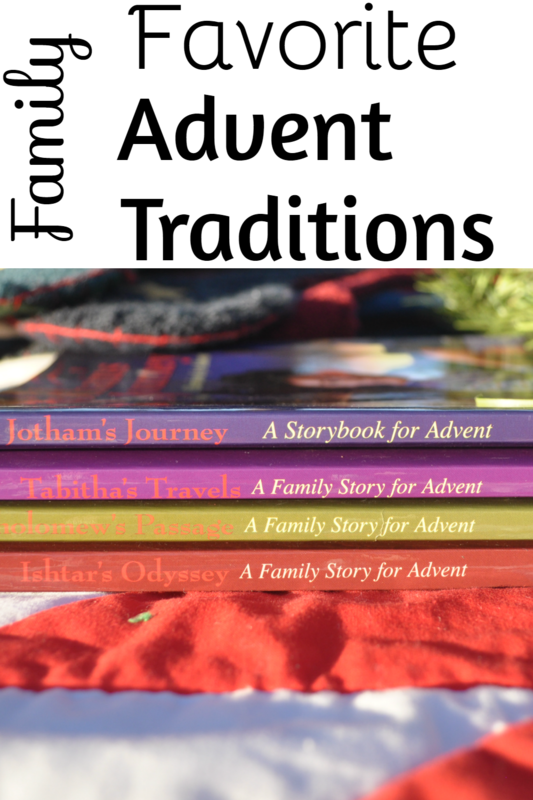 Advent is quickly approaching and I wanted to share 10 Favorite Advent traditions. Before I start telling you what we do, please understand this is what we do now. We haven’t always had these Advent traditions and we may not always do them. It’s called life and it’s fluid and fun and some seasons need to be more practical than others. I just needed to get that out of the way because I don’t want you to see what we do and think one of two things: I have it all together or I don’t have it all together and need to get it together! Advent traditions can change and grow and morph into something entirely different than what they started out as. And this different can be good and it can be necessary. Please know, there is not a right or wrong way to celebrate Advent. There is no, “If you’re holy, you do it this way.” Also, the Advent traditions we celebrate now have taken shape pulling good ideas from here and tossing ideas that aren’t for our family to the side. If you see an idea you like, pray about whether it would be a good fit for your family; if not, then please don’t do it. Three years ago we heard about the book Jotham’s Journey and started reading it. Our entire family LOVED it! From Chris and me all the way to the younger children. 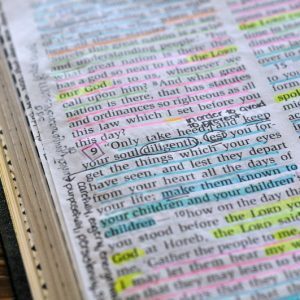 Each night, right before family prayer we would read another harrowing adventure of Jotham. And harrowing they are! 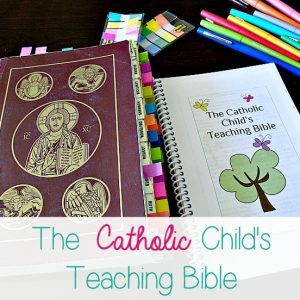 A note of caution, if you have a very sensitive child, pre-read the chapters and consider how you will re-word or skip a few parts. I felt like the intense parts were few and easily skipped or softened if I needed to. We were reading Jotham’s Journey with our children ages 15-1. Although we were happy for Christmas Day, we were sad to have ended the book. Thankfully it’s one of a series of four. We will read the last one in the series, Ishtar’s Odyssey, this year. I’m sorry, blame it on my Choleric temperament, mothering a large family, laziness or thing about shoes; when it comes to hanging our stockings, I prefer to kill two birds with one stone. Meaning, one of our Advent traditions is to hang our stockings the First Sunday of Advent. (We don’t have these, but I love the religious theme on these.) We do this because December 6th is the Feast of St. Nicholas. The tradition is to have your children leave their shoes outside their door or by the fireplace or somewhere and St. Nicholas will leave gold coins in their shoes. I’m not going to go into all the details of this fun feast day because there are entire websites devoted to St. Nicholas. Here’s our spin on it. We hang our stockings up the First Sunday of Advent. On December 5th, the Eve of the Feast of St. Nicholas, the children write out their Christmas lists. They ask for things they want, they thank God for the things they have and they mention the prayers and sacrifices they will especially offer during Advent. St. Nicholas leaves gold coins and usually a family gift, like a game. We have a hard enough time finding clean shoes for Church much less to put something edible in. This also gets me one step coser in the Christmas decorating department and I think it gives the stockings more of a spiritual significance because they are the means St. Nicholas uses to leave their gold coins. Many years ago we received a lovely wooden crib with a porcelain Baby Jesus. (I cannot find the exact one. but did find this one on Amazon.) We put this crib out–sans the Baby Jesus–the First Sunday of Advent with a dish of cut up yarn. We have used string, straws or hay in years past. When our children do a good deed or offer a sacrifice, they can put a little piece of yarn in the crib to make it nice and soft for the Baby. We typically do this before family prayer as well. Little kids love this! They love everything from cutting the yarn or gathering the hay or straw to putting them in the crib, trying to fill it up for Baby Jesus to have a soft place to sleep. We place this crib in the center of our Advent Wreath. Our Advent Wreath is decorated with red berries, pine cones and an apple. We started adding an apple after we heard some families do this to remind themselves of Adam and Eve. They ate the apple thatmade it necessary for the our Lord to come to save us. Another of our Advent traditions is to set up our Nativity on this day too. We set up Mary, Joseph, the Angel, sheep and shepherds, and an empty crib. We do not display the Baby Jesus (if we can help it). Advent is a time to prepare for the Baby to born and we want this physical absence to be a reminder that we are in a time of waiting. A note about this–some friends gave us their first Nativity set they bought the first year of their marriage over thirty years ago. It’s a stable with Joseph, Mary, two sheep and the Baby Jesus glued to it. Of course we put this set out, prominently, proudly, and lovingly displayed. We do not bring out the Wise Men. They don’t come out until after Christmas when they begin their journey to adore and bring gifts to the Baby on the Feast of the Epiphany. Our children LOVE the Fisher Price Little People Nativity Christmas Story. If there was a stronger word I could use here, I would. They play with this all.the.blessed.day during Advent and Christmas. They ask to play with it during the year. They rarely fight over it–and the angels sang right?! If you don’t have one, you will absolutely will not regret buying one. Year after year this Nativity set for kids never gets old. And yes, it’s perfectly acceptable for a Fisher Price Nativity set to have a favorite place in family Advent traditions. The First Sunday of Advent our children draw names–their Kris Kringles. This is the brother or sister you will pray for, do good deeds for, and make extra sacrifices for during Advent–hopefully in secret. They will also buy a small Christmas gift for their Kris Kringle. This is always so much fun but I do have to remind the older kids not to ask the younger ones any questions. Once one person blows it and reveals or hints at their Kris Kringle, the rest of the children spend the next couple of weeks trying to figure out who drew who. This is one of our favorite Advent traditions. We put our tree up on the First Sunday of Advent as well. We used to put it up whenever. Then we tried to wait until Christmas Eve to help us remember we’re in a time of preparation, not celebration. We have found what works for our family. We put our tree up the First Sunday of Advent and string it with purple lights. Liturgically, purple is used during times of penance like Lent. Not having a tree up felt empty. Having it up too soon felt like we bypassed Advent and went straight to Christmas. This way, we have an obvious, visual and large reminder, “It’s not Christmas yet.” The Third Sunday of Advent is called Gaudete Sunday or Joy Sunday and this is the day we exchange our penitential purple lights for white and multicolored ones and decorate our tree–Christmas is close! Many families wait until Christmas Eve to decorate. That just did not work for us so we decided on Gaudete Sunday. We leave our tree up at least until after the Epiphany on January 6th. I used to be a young, energetic mom with a few children and we made so many cookies it was ridiculous. We made them as Christmas gifts, but still. Different flavors, shapes, and styles. Days of baking. It became too much physically, financially and time-wise. But dipping pretzels? So much fun! It’s inexpensive and not time or labor intensive. They make great gifts, taste yummy and are even fun to decorate with drizzled chocolate and sprinkles. My children and big kids think this is one of the best Advent traditions we have! I’m not sure when we started praying this novena? If I had to guess I’d say it might have been after reading Sarah Mackenzie’s enthusiasm for this particular novena. And her answered prayer of not one, not two, but THREE babies as an answer to her St. Andrew Novena. 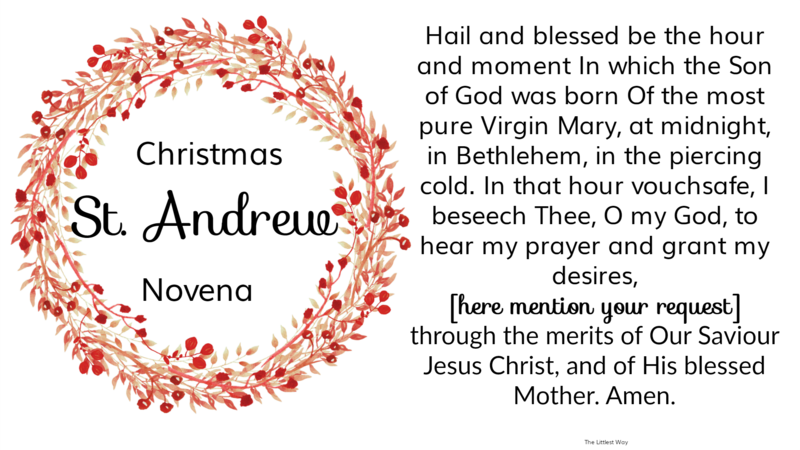 I’ve updated the printable I usually offer–here’s 2015 and 2014 St. Andrew Novena posts. This year I made it into a bookmark…and a mobile wallpaper…and a desktop wallpaper. To read more about this devotion please visit my posts from last year and the year before. There are a couple of feast days we celebrate during Advent: St. Nicholas, Our Lady of Guadalupe and St. Lucy. I explained above how we celebrate the Feast of St. Nicholas. For Our Lady of Guadalupe, we eat a yummy Mexican meal and for the feast of St. Lucy we drive around looking at Christmas lights. 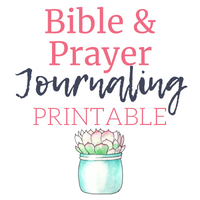 **Bonus–I have a free Daily Advent Devotional for Women for email subscribers to The Littlest Way. Click here to get yours! As I mentioned above, these family Advent traditions have evolved. Some years we’ve done more and some less–but not much less. These are fairly simple and easy to implement, even the year my husband traveled eight of twelve months. The year all the kids and I were sick with various degrees of respiratory infections and pneumonia–while he was traveling. The years we’ve had a new baby or a very pregnant momma. 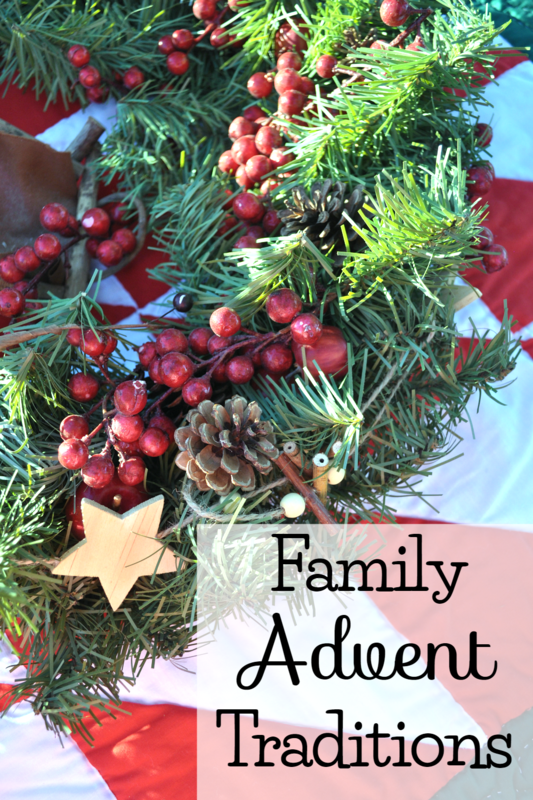 I would love to know some of your favorite family Advent traditions, leave them in the comments. We do the read aloud, put out stockings/shoes for St. Nicholas, set up the Nativity, prepare a Jesse tree, say the St. Andrew novena, and pray for those who send us a Christmas card (we have a basket for cards next to our Advent wreath). We do all except the pray for Christmas card friends. For some reason, my mind just cannot wrap around keeping them out. Thank you so much for this post! I always struggle with what to do during Advent and become overwhelmed with all of the choices and then end up doing nothing. I will take a few of these and incorporate them and try my best not to read any more and become overwhelmed yet again. These seem relatively easy to incorporate and I think my kids will enjoy them. I agree with the overwhelm. There are so many lovely, fun, and significant customs and traditions out there. But like you, I find if I try too many, I end up doing nothing. Let me know which ones you choose and how they work for you. 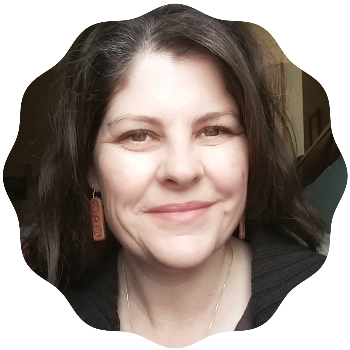 I really enjoyed reading this post and imagining what it must be like – lovely! 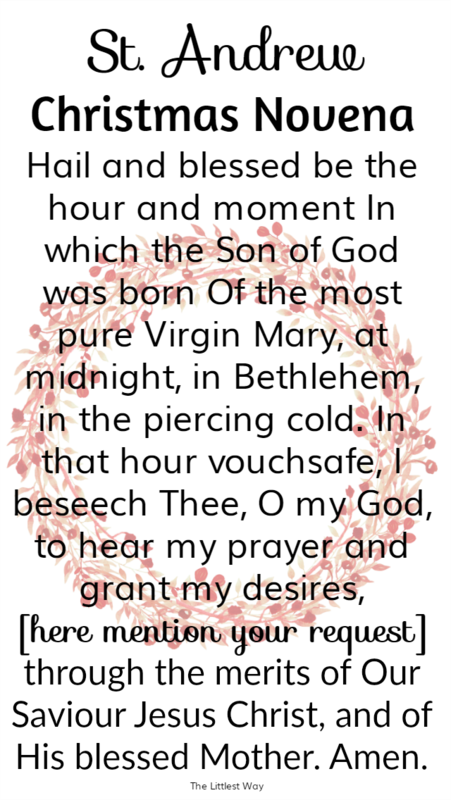 Our Advent is very simple – we have the Advent wreath in chapel and our prayer has an Advent theme. We do the Kris Krindle in community. I always enjoy this very much – leaving simple gifts or messages at the person’s door. I must think if we can adapt some of your other ideas…You are so creative! I love this. I have 4 under 8 so I remember quite a few years of feeling overwhelmed during Advent! Everyone is over 2 this year so I feel like I’m ready to go beyond the Advent wreath! These feel very doable yet also very meaningful! Haha! “Everyone is over 2 this year…” I have found there is a season where it gets fairly smooth and then they hit teenage years with jobs and sport practices and a consistent Advent schedule seems elusive again. Our Traditions at home since I got married have been to try and get the Christmas tree and the nativity set up the weekend of Thanksgiving. the nativity set is especially important because that is a tradition that goes back to my childhood days in Mexico with my great-grandmother. We also don’t lay baby Jesus down until Christmas eve and when we bring him out we kiss his feet and get a piece of candy. Also we don’t remove our decorations until the epiphany! Now that we are parents we are going to try to start new traditions, I guess we will have to see what we come up with, so thank you for the ideas! What is the significance of kissing His feet? I absolutely love the idea even if you’re not sure of the reasons behind it. Our traditions have evolved from babies to an older shift of children in the house. These listed are pretty much our stand-bys no matter the season. It’s more of a symbol, like kissing the feet of Christ. As kids we loved to do this because we knew the candy was coming, so as we got older we understood the meaning of what we were doing. I also forgot to mention that we celebrate Christmas Eve and we stay up and celebrate until midnight, even the children if they can (which they usually do) since we open gifts at midnight. This is a tradition that I do with my husband now, we stay up and have dinner and then open gifts and give thanks. It has worked out great because we get to spend Christmas day with other family.